10to8 is a cloud-hosted appointment management tool that aims to help small startups, large enterprises, and everything in between streamline their schedules. Trusted by over 42, 625 businesses worldwide, this software solution is great for averting schedule conflicts, reducing missed meetings, as well as preventing miscommunication between businesses and their clients. Moreover, it does all this with minimal administrative burden for you and your staff. It even won our 2017 Supreme Software Award as well as our Great User Experience Award. With this at your disposal, you have access to a full suite of scheduling features that can greatly simplify and streamline how you manage your schedule and how you coordinate with your clients. Whether you need 24/7 appointment booking options and calendar synchronization tools or reminder automation features and client management capabilities, this software has your needs covered. This mobile-ready platform even has functions that let you merge it with external apps, process payments in-software, as well as create custom reports that match your workflow. Nothing’s worse than dealing with last-minute cancellations and missed schedules. With 10to8, you may send automated notifications to clients to remind them of upcoming meetings and changes to your schedule. The platform even offers a built-in two-way chat feature that you can integrate with your calendar system. This way, you can efficiently keep communication open and easily accessible for both you and your clients. The appointment scheduling app makes coordinating various parties to an appointment easier by ensuring all parties are kept updated and in the loop. For instance, medical appointments require the synchronized schedules of the doctor, secretary, the patient and other medical specialists or healthcare facility, where necessary. This benefit applies to any service with different parties required for a single appointment. 10to8 allows you to have 360-degree view of your staff availability and resources. With this, you can facilitate smoother internal communication, share documents faster, pinpoint cancellations much easier, and relay schedule updates with just a few clicks. All of these are even logged in the database for easier auditing in the future. For your convenience, the software also offers permission and role options so you can control access to bookings and modifications to your system. Finding a software that meshes well with your workflow is difficult and time-consuming. This is why 10to8 provides its users with a scalable interface that can cater to the needs of all business sizes. This way, you no longer have to invest in a different platform every time your company’s needs change. 10to8 is even equipped with custom API capabilities and can support over 500 third-party applications via Zapier so you can use it alongside your existing business systems. While transparency is important when it comes to important meetings, activities, and other tasks on your company’s schedule, you should make sure that these information are kept away from prying eyes. 10to8 is built on bank-grade security using encrypted data and compliant to the Data Protection Act. This way, you can make sure that only authorized personnel have access to your data. With more schedule efficiency, you maximize your occupancy rate or foot traffic, while reducing no-shows. Likewise, your staff and resources can handle more clients with proper time management. All these leads to more revenues for you. Furthermore, 10to8’s web-based booking platform gives you a way to capture online clients. You can embed a booking form on your website or newsletter, greatly expanding your reach. Clients can book through and get reminders from their smartphones. With visibility of all your appointments, you can adjust your opening times, extend working hours, or manage holidays and earn more revenues in return. 10to8 has got a really efficient calendar sync system. Thanks to integration with top online calendar services, 10to8 instantly updates entries to ensure that there are no double entries for a particular slot. There is also a digital notepad available to let you keep client notes and manage their history. This feature is particularly helpful for managing clinics where patient history is quite important, but also valuable to any business looking to preserve traction with active customers and potential buyers. Basically, 10to8 collates all data in a single hub, from where managers can access it at any point of time, using both their local or mobile devices. Payment processing is also available in this software. You can receive advance deposits from your clients which ensures that there are no cancellations or no-shows. This eliminates the need to use expensive third-party software to manage financial operations, but despite of it, 10to8 still provides some interesting integration alternatives. From July 2017, 10to8 users can take payments not only with Stripe but also with PayPal and SagePay. 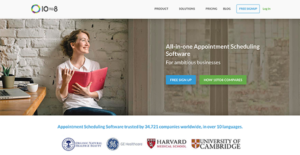 If you are interested in 10to8 it could also be a good idea to investigate other subcategories of Best Appointment Scheduling Software collected in our database of B2B software reviews. Since each company has unique business needs, it is prudent for them to desist from looking for a one-size-fits-all ideal software application. Needless to say, it would be pointless to try to find such a platform even among market-leading software solutions. The smart thing to do would be to jot down the various important elements that require consideration such as main features, finances, skill levels of staff members, company size etc. Then, you should do your groundwork thoroughly. Read some 10to8 reviews and check out each of the other systems in your shortlist in detail. Such comprehensive research can make sure you discard ill-fitting platforms and select the app that offers all the elements you need for business success. How Much Does 10to8 Cost? We realize that when you make a decision to buy Appointment Scheduling Software it’s important not only to see how experts evaluate it in their reviews, but also to find out if the real people and companies that buy it are actually satisfied with the product. That’s why we’ve created our behavior-based Customer Satisfaction Algorithm™ that gathers customer reviews, comments and 10to8 reviews across a wide range of social media sites. The data is then presented in an easy to digest form showing how many people had positive and negative experience with 10to8. With that information at hand you should be equipped to make an informed buying decision that you won’t regret. I recommend this to every business user out there. A great tool for calendar scheduling. Using it for volunteer appointment management and project research. This a great solution for my private practice. What are 10to8 pricing details? What integrations are available for 10to8? Pros: I find it so simple to use. The simplicity it brings makes things super convenient. Now, people won't have to worry about setting up an appointment. It's a breeze, really. The site that they'll be working with is nice and professional-looking. Cons: It'd be nice to have an option where you can put in a text message. You'll need to get to the proper pricing structure to have something like that in the system. I think it would be ideal if the end-user has some kind of a one-month free trial or something. Pros: I love how the tool lets my team use and set up appointments using the same calendar. Their customer support is speedy, listens to whatever it is that you have to say, and are constantly oriented to giving you the best solution for every problem encountered. Our team is almost always looking forward to delivering their product. Cons: When it's taking forever to be do something or at least make changes to something, I end up getting annoyed. Whenever a client tells me they've set up an appointment date and the site prevents that client from successfully doing so, I feel like I'm letting everyone one. I find this to be inconvenient.